You can use the scheduler to create and remotely archive automatic backups. Other system modules can integrate with the scheduler to provide additional automated maintenance tasks. Tip: Log on to our support portal and read how to set up a Windows SSH server with keys in order to backup system settings. 1. Go to the System > Maintenance > Scheduler page. • Day — From the drop-down list, select the day of the week that the tasks will be executed. • Hour — From the drop-down list, select the time of day at which the tasks will be executed. This is the default option, archives are never pruned. Select this option to prune archives that are older than one month. Select this option to prune archives that are older than two months. Select this option to prune archives that are older than three months. Scheduled remote archiving uses SSH keys to allow the Smoothwall System to securely copy files to a remote SSH server without the need for passwords. The use of SSH keys requires the Smoothwall System to generate a key pair which it will use to encrypt all file transfers sent to the SSH server. The SSH server must be configured to accept connections from the Smoothwall System in this manner – it requires the public half of the key pair to be installed. 2. In the Remote archive destinations panel, click Export Public Backup Key. 3. Install the public key on the remote SSH server – for details on how to do this, refer to the administrator's guide of the SSH server in use. • Name — Configure a meaningful name for the destination. • Username — Specify the user name of the account on the SSH server that will be used. For additional security it is recommended that this user has no additional privileges and is only allowed write access to the specified Remote path. • Remote path — Enter the path where archives are to be stored on the remote SSH server, for example: /home/mypath/. If left blank, the Smoothwall System uses the default home directory of the specified remote user. • Server — Set the IP address of the SSH server. • Port number — Set the port number used to access the SSH server (normally port 22). • Transfer speed limit — From the drop-down list, choose maximum transfer speed when automatic archiving occurs. This control is useful for preventing the automatic remote archiving system adversely affecting the performance of other network traffic. • Comment — Configure an optional description of this destination. 6. Repeat the steps above to make other destinations available. • Day — From the drop-down list, select the day of the week to carry out the archive. • Hour — From the drop-down list, select the time of day to carry out the archive. • Archive destination — From the drop-down list, select a destination as configured in the Remote archive destinations area. • Archive profile — From the drop-down list, select an archive profile as configured on the archives page. • Enabled — Select to enable the archive. • Comment — Configure an optional description of this archive. 9. 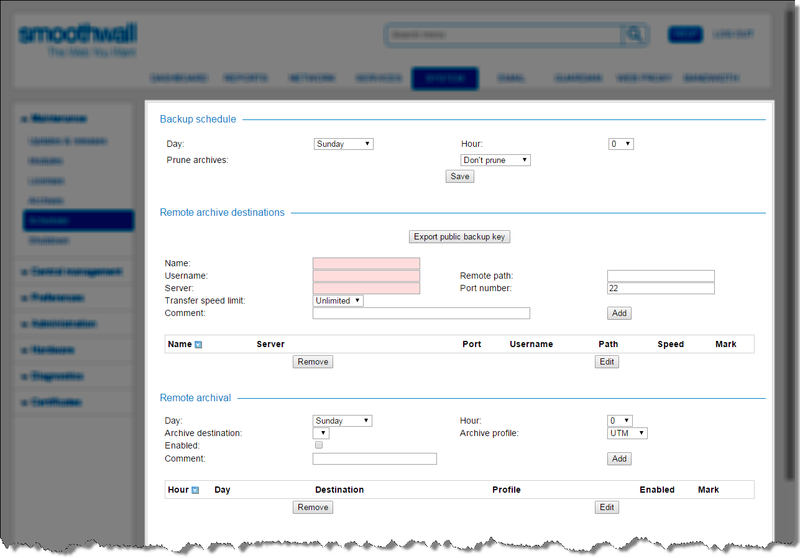 Repeat the steps above to configure other archives for scheduled remote archive. Note: A local copy of the archive is also created and stored.